Find tons of homemade Halloween costumes to make this Halloween! If you've always admired the homemade Halloween costumes that you see trick-or-treaters wearing, why not make this the year that you create your own? There are plenty of ideas to choose from in our free eBook, Creative and Cute Halloween Costumes: 14 Costume Ideas to Make at Home. Homemade Halloween costumes much more friendly for your wallet than buying a pre-made costumes at the store. When you make your own Halloween costume, you get to be so much more creative with the concept, design, and overall appearance of your outfit. Since there are so many wonderful Halloween costume ideas to make at home, we thought we'd help you out by putting together a collection of the very best creative and cute homemade Halloween costumes from all over the Web. In this free, downloadable eBook, Creative and Cute Halloween Costumes: 14 Costume Ideas to Make at Home you'll find everything from adorable character costumes, to cute animal-themed outfits, and so many more creative and cute Halloween costumes. There's so many, we can't even begin to name them all. 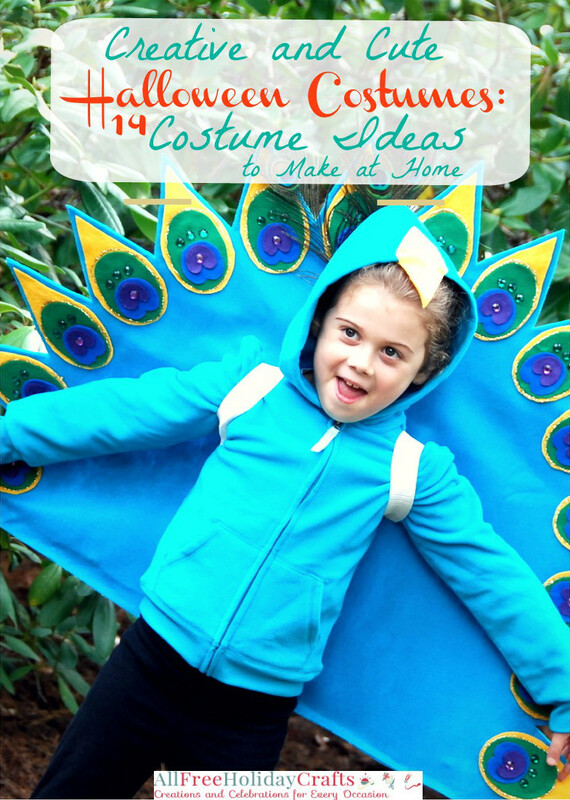 Download your free copy of Cute Halloween Costumes: 14 Costume Ideas to Make at Home today! On Halloween the last thing you want to be is unoriginal. That’s why we love the idea of homemade costumes. Whether it’s an outfit for yourself to wear to a party, or costumes for your children to wear trick or treating, unique, handmade costumes are always the ones that get noticed. From character costumes to animal costumes and everything in between, we’ve scoured the Internet for the best homemade Halloween costume ideas for boys, girls, and even pets! In Creative and Cute Halloween Costumes: 14 Costume Ideas to Make at Home, there are so many awesome ideas for costumes that will turn heads and wow crowds, we wish that Halloween was more than just one day a year! Download your free copy of Creative and Cute Halloween Costumes: 14 Costume Ideas to Make at Home today! Belle Dress (pg. 11) - There's nothing a little girl wants to be more than a princess, so for Halloween this year let her be one. This tutorial shows you how to Sew a Beautiful Belle Dress using comfy knit fabric. Every detail of this homemade Halloween costume is exactly like the original, down to the lovely draping of the skirt. Pebbles Flintstone Baby Costume (pg. 5) - How adorable is this Pebbles Flintstone Baby Costume? If you're looking for easy Halloween costume ideas for your baby or toddler, you won't find one cuter than this little dress and hair clip combo. All you need to complete this Pebbles Halloween costume is a little friend to be Bamm-Bamm. 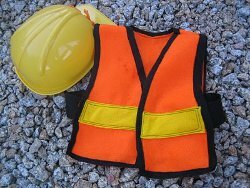 How to Make a Construction Worker Vest (pg. 14) - Is your little guy obsessed with tools and mechanics? If so, here's a great homemade costume idea he'll love, the simple orange and yellow uniform of a construction worker. This tutorial shows you How to Make a Construction Worker Vest in just a few easy steps. Cardboard Box Train Costume (pg. 16) - Imagine how cute your little conductor will look wearing this adorable Cardboard Box Train Costume. There are so many homemade Halloween costume ideas that involve sewing, but if a needle and thread aren't your thing, this is the project for you. Learn how to make your own toddler train costume by following this easy tutorial. Harry Potter Dog Costume (pg. 40) - Harry Potter is so popular that even pets want in on the trend. Transform your four-legged friend into a wizard. As you'll see this year, this one is by far the trendiest dog costume ideas. The Harry Potter Dog Costume features both a cape (complete with Gryffindor crest) and the iconic black rimmed glasses. Before you know it, your dog will be a master wizard. If you enjoyed this eBook, you won't want to miss any of our other downloadable holiday craft collections. You can browse our entire library of free eBooks here. Weekly emails with free craft projects, tips, collection pages, videos and more. DIY ideas and inspiration for all of your favorite holidays and occasions, including Thanksgiving, Christmas, Valentine's Day, Easter, and more. Be sure to sign up for the Create and Celebrate holiday craft newsletter today so you don't miss another issue!